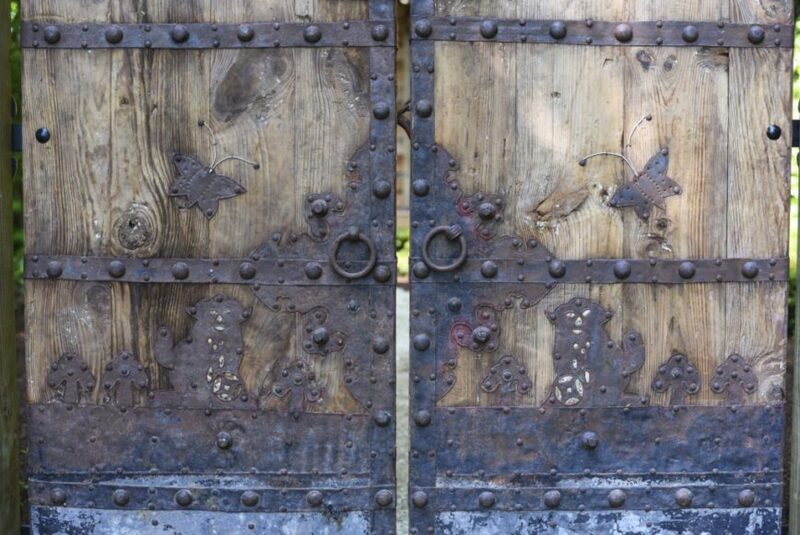 Throughout April, there was something rather exciting going on at the end of the Millbridge Court grounds. After months of planning, landscape gardeners got to work planting Laurel hedging, ferns & installing an incredible pair of vintage gates in front of our Bridal Suite, the Hideaway… & now that all of their hard work is complete, we’re excited to introduce to you all, The Hideaway Secret Garden! A botanical sanctuary just beyond our flower meadow that creates that extra bit of magic & privacy for our couples on their Wedding Day & the morning after the celebrations. A tranquil & peaceful space to be able to enjoy all to themselves. And we love that we have already received pictures of photographers using the Secret Garden as a backdrop for gorgeous couples shots… here are L&S captured by The Springles last week. And J&T captured beautifully by Joanna Nicole Photography earlier in May! We can’t wait to see many more over the course of the Summer! 1) What is your Role at Kalm Kitchen? 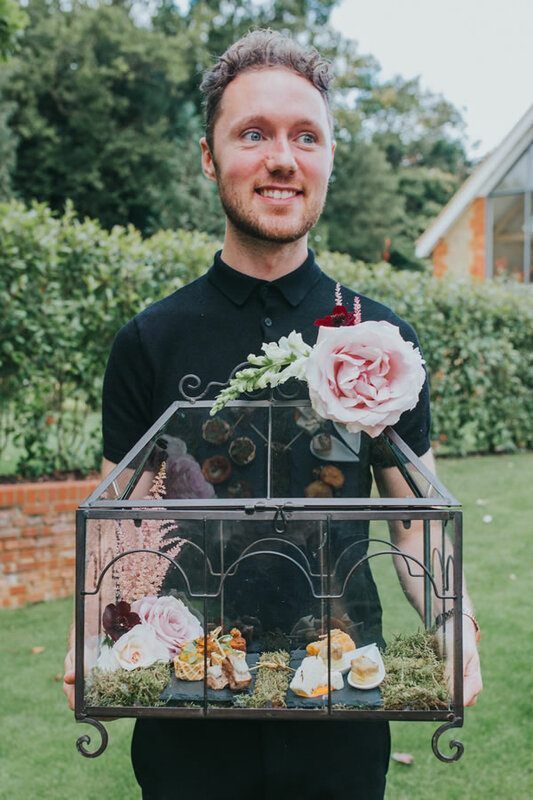 My role in Kalm Kitchen, as a wedding events manager, is to create a calm and unforgettable planning experience, leading up to the big day. We are passionate about providing creative and delicious food for your wedding day and providing an exceptional service throughout the journey, going that extra mile, with meticulous attention to detail. On the event day we will execute your plans to perfection and bring everything we’ve discussed to life. 2) What made you want to be an Event Manager at Kalm Kitchen? My work life has always consisted of running events and the joy and accomplishment I get from them are next to none. My best friends got married in April 2017, before I had started with Kalm Kitchen, and I was heavily involved with the planning process. I knew from then that this was the industry I wanted to be in. Meeting new faces has always been a pleasure of mine and making my client’s dreams come true only makes it better. Kalm Kitchen had impressed me so much with their styling, food menu and work ethic, that as soon as I heard they were looking for an event manager, I didn’t think twice about applying for my dream role. 3) What do you love the most about being a part of the Kalm Kitchen family? The word family is exactly what I would describe Kalm Kitchen to be. We all have our quirks and strengths, which I feel really develop us in our roles. The owners of Kalm Kitchen, Jen and James, have been such an inspiration to me and I cannot thank them enough for the time and effort they put into all of us, which then reflect in our events. Kalm Kitchen has not only given me great colleagues to work with, but friends for life! 4) What tips & advice do you give to couples during their planning journey? I would tell them to enjoy every moment of it. I think it is natural to want perfection for the big day, which can add too much pressure and cloud the enjoyment of talking through their ideas. 5) What is your favourite part of a wedding day? Seeing our couples for the first time in the morning has always been so special for me. I love that initial catch up and excitement you share together. It is such a lovely moment that I wish I could bottle up every time. 6) What new wedding food trends should couples be looking out for over the coming year? Food stations are an amazing statement for the big day. The “wow factor” that comes with them offers such a great experience for guests and something delicious they do not expect. Our Lemonade and Lollipop stand works perfectly for a hot summers day and looks incredible! Or, for the evening, our Honeycomb and Hot Chocolate station satisfies those sweet cravings and brings everyone together as the night draws in. Complete Bliss! 7) If you could choose your dream Kalm Kitchen menu, what would it be? I love the sharing experience for the wedding breakfast. I would have a middle eastern sharing board with an abundance of dips, breads and my personal favourite, halloumi! As a vegetarian I would have our delicious arancini ball, which is available in an abundance of flavour and accompaniment combinations, to suit every taste. Mine would be a mozzarella, basil pesto and pine nut arancini on a bed of caponata and fresh basil. Dreamy! A sharing dessert is a must! I am a chocolate fiend, so mixing this together with salted caramel and layers of meringue to create a slice at the table pavlova is perfection. You can nominate one person per table, and dress them in aprons, chef hats and moustaches, to collect the pavlova and serve the guests on their table. These are the little touches that create lasting memories of your special day. You just know it’ll be a talking point for years to come. 8) What do you love most about Millbridge Court? I know I can speak on behalf of all our couples getting married at Millbridge Court, that this is the dream venue. The balance of contemporary design and country home works perfectly and instantly makes you feel at home when you walk through the front door. 9) What are your favourite linen and glassware colour combinations at the moment? I am in love with vintage oak trestle tables paired with our luxurious urbane napkin range, it effortlessly really brings an outdoor feel inside. Having a spot of colour in the water glass elevates the whole design of the table. An idea would be to speak with the florist to match the colour palette of the flowers and unite all the elements together in harmony. My personal favourite is to have a bronze coloured water glass with a chalk urbane napkin as showcased in the most recent May tasting evening. 10) Who are your three favourite Wedding Industry professionals/brands to follow on Instagram? @bubblegumballoons Their installations are the work of dreams. With a huge range of clients under their belt, they have proven that balloons are stylish, luxurious and most importantly fun! @kindredxstylingbyjen showcases creativity and adventure. If you want to feel inspired by the latest trends and interiors to elevate your style, Jen is your girl. Last Sunday, we hosted our Annual Spring Preview & what a gorgeous preview it was, thanks to the amazing MBC Partners that joined us; creating inspiring displays & chatting away with our lovely MBC couples. Showcasing stunning tablescapes in our Dining Barn were Alice (Meadowfolk), Carrie (The Topiary Tree), Katie (Blackberry & Bloom) & Gill Pike who each created such varied arrangements, from the rustic to the bold & beautifully blowsy… there was something for everyone. We had amazing wooden banquet tables & cross back chairs provided by Academy Furniture Hire & each table was complimented by coloured glassware from Crystal Hire. The beautiful flowers weren’t just confined to the Dining Barn with Gill Pike showcasing her breathtaking foliage Moongate Arch in our Ceremony Barn, the perfect backdrop to any Ceremony & Carrie Macey created a statement urn arrangement outside the Millbridge Court entrance, a wonderful way brighten up a rainy day! Further brightening up the grey day was Laura from Laura’s Paper Heart who serenaded our guests so beautifully throughout the event. In our Bridal Changing Suite we had the amazing Carolanne Armstrong & Sharon Roberts doing Express Hair Styling & Make Up Sessions for our Brides. Such a wonderful opportunity to ask these very knowledgeable & talented ladies any questions & to trial a hairstyle/make up look for their Big Day. Showcasing gorgeous Wedding Cakes were Andi Freeman & Melissa ( Thirty One Cakes) who also had delicious testers for our couples to try & the even more tasty treats were provided by Kalm Kitchen who circulated Canapes, yummy bowl food & they also put together yet another incredible Patisserie Boutique, with added foliage & Spring Flowers from Blackberry & Bloom. We had MBC Partners Philippa Sian Photography, Jon & Laura from VLA Wedding Photography, Neale James & Sophie Duckworth showing our Brides & Grooms the phenomenal Wedding Days they have captured at Millbridge Court over the years. Thank you also to Ash Videography & Chris & Amy from W4 Wedding Films for not only joining us, but for putting together really beautiful videos of Sundays Event (you can find these on our Instagram & Facebook page). Thank you so much to everyone that came to our Preview, we hope that you all had a really wonderful time & left truly inspired for your Wedding Day. Last but not least, thank you to Sophie Duckworth for sharing her fabulous images of the day with us; we have shared a selection of them below for you all… Enjoy! When the likes of MBC Partners Philippa Sian photography, Bubblegum Balloons & Bex from Blush Floral Design are brought together for a Wedding Day, we just know that the Venue will look utterly breathtaking & that every last detail will be captured so perfectly… & J+T’s Wedding Day turned out to be just as spectacular (if not even more spectacular) than we had anticipated. The gorgeous florals & styling details started from the entrance with Bex creating cascading floral arrangements which overhung the doorway & these beautiful touches continued throughout the Barns & into the gardens. The Archway in to the Arbor Garden was adorned with blush, pink & white blooms; white rose petals lined the aisle & two elegant arrangements situated in copper vases framed the Arbor. The perfect styling and backdrop for a Summer’s Wedding Ceremony! J+T’s vision for their Wedding Breakfast came to life so wonderfully. 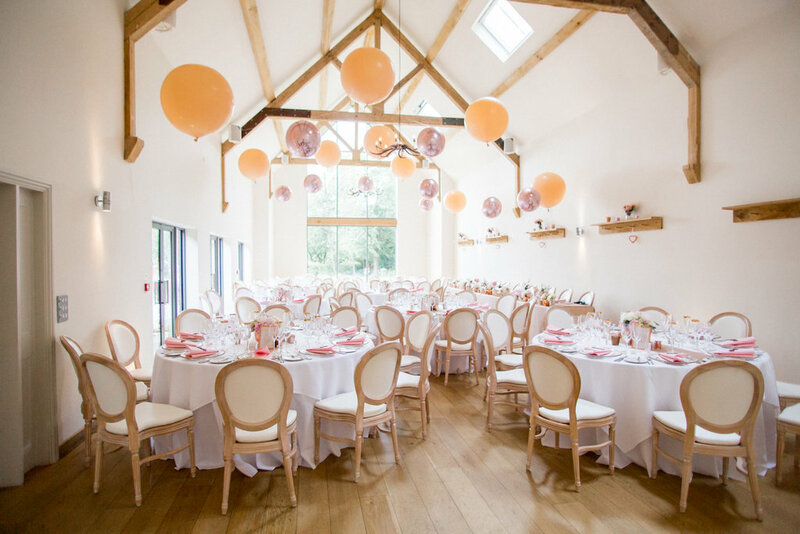 The Bubblegum Balloons installation of giant pink metallic & peach balloons along the beams of the Barn was such a showstopper & extra touches such as Glimmer & Thread’s sequin table runners & glamorous Louis chairs (provided by Academy Furniture Hire) created such a luxurious look. Adding to that luxury was Bex who created abundant dome centrepieces bursting with peonies, hydrangeas, roses & eucalyptus. The amazing Philippa Sian Photography was the Bride & Grooms chosen photographer, & as always with Philippa, every last detail & all of personal touches were captured so amazingly & the love & emotion of the day is translated beautifully in her pictures. As we move in to this chilly time of year, we thought we would take a look back at J+D’s wonderful August Wedding Day; a Wedding Day which involved a sunny Arbor Ceremony with most romantic blooms, a gorgeous Patisserie Bar, a show stopping balloon installation & so many happy, smiling faces. J+D had a really beautiful vision for their day with an elegant colour palette of whites, greys, soft greens & peaches. Creating the floral arrangements that would help to bring their vision to life was the super talented Bloomin Gayles who adorned the Arbor with a sensational cascading eucalyptus & foliage installation, along with two pillar arrangements bursting with delphiniums, roses & white hydrangeas. The beautiful floralising continued within the Dining Barn with Gayle creating gorgeous alternating centrepieces which were complimented perfectly by the soft grey table linens & white napkins chosen by the couple. And adding even more wow factor to the Wedding Breakfast setup was Bubblegum Balloons who created a phenomenal hanging installation along the beams using peach & metallic pink giant balloons. The Bride & Groom chose to make the most of the interactive menu options that the fabulous Kalm Kitchen offer to Millbridge Court couples & had carve at the table Lamb as their Main Course & a rather gorgeous looking Patisserie Bar, made all the more beautiful by Gayle’s flowers, for dessert. The perfect menu choices to allow guests to mingle & interact throughout the Wedding Breakfast. Capturing every styling detail, personal touch, spectacular floral arrangement, gorgeous couples shots & all of the happy moments in-between was the wonderful Philippa Sian; a photographer that we have had the pleasure of working with on multiple occasions over the course of the past year & who always brings the most wonderful energy to any Wedding Day. Thank you to Philippa for letting us to share a selection of her beautiful images & thank you also to J+D for allowing us to play a part in what was such a beautiful celebration! We wish you both so much love & happiness in your married lives together. This week, we’re sharing with you all a selection of gorgeous images taken by the lovely Jasmine Andrews, of the food, drinks & the beautiful setup from our September Tasting Evening. We love the opportunity that these evenings provide for our couples, not only because they get to try & choose their Wedding Menu but also because they are able to see the Venue in action & at nighttime, they can also gain Wedding inspiration from a handful of fabulous MBC Partners, as well as getting to see the team once again & they can also meet other Millbridge Court couples who they can chat to & share their thoughts & ideas with throughout the evening. Creating the breathtaking tablescape was our newest MBC Partner, Eden Blooms, a Farnham based Florists who we have had the pleasure of working with on many occasions over the past few years, & who created such intricate & delicate jars of flowers, in wonderfully vibrant & deep autumnal colours on the day of our tasting. Complimenting the change of seasons further was their use of metallic pumpkins & candle holders, as well as a beautiful moss wreath which hung from our shelves. Adding the final touches to the table setup was the one & only Judy Broad Calligraphy who made such exquisite place cards using gold ink on deep blue card which matched the blue & silver striped linens so perfectly. Serenading our wonderful MBC Brides & Grooms throughout the evening was Tristan Mackay, an amazingly talented musician, singer & songwriter who we always adore working with & listening to. Lovingly bringing the menu to life was the always outstanding Kalm Kitchen. From the canapés, to the sharing plates, to the intricately plated dishes & the Patisserie Bar (complete with cascading florals by Eden Blooms no less), everything looked, smelt & tasted divine. Thank you to everyone who we worked alongside to create yet another wonderful Tasting Evening & to all of our lovely Millbridge Court couples who attended, we hope you had the most fabulous evening with us! So, without further a do, here are Jasmine’s gorgeous snapshots of our September Tasting Evening! Happy browsing. On Sunday, we hosted the Millbridge Court Autumn Preview; an event we host twice a year for our MBC couples, so that they can see the Venue filled with breathtaking Wedding inspiration, as well having the opportunity to try some delicious food & chat to the Millbridge Court Partners showcasing their beautiful work. We are always completely in awe of what our wonderful Partners create on the day & last weekend was certainly no exception. Creating exquisite tablescapes & arrangements throughout the Venue were Paula Rooney, Carrie Macey (The Topiary Tree), Bex Morgan (Blush Floral Design) & Hannah Berry & showcasing their gorgeous & intricate Wedding Cakes were Andi Freeman & Ellie (Milk Street Kitchen) whose setups looked ever so gorgeous with extra floral touches provided by Blush Floral Design. Kalm Kitchen once again created a jaw-dropping Patisserie Bar alongside Hannah Berry flowers, complete with a hanging branch installation, orange & metallic pumpkins & seasonal blooms. They also launched a new & innovative food stall… The Pretzel Bar! The photographers who joined us for our preview were VLA Wedding Photography, Philippa Sian Photography & The Springles; photographers who are always such a pleasure to work with, are immensely talented & all have such distinctive looks. Alongside them, we also had Hannah Aldridge (Hannah Films) showcasing her gorgeous Wedding Day videos for our couples to see. Adding to the ambience was Thom Morley who serenaded our Brides & Grooms throughout the day and we also had the pleasure of having the ever so lovely Gemma Milly joining us & displaying her stunning stationary. Thank you to Kat & Ash for taking the time to take such amazing images of the day & we are so excited to share them with you below. Thank you also to the Philippa Sian for sharing her beautiful images with us also, many of which we have shared on our Instagram feed… so if you don’t follow us already, you can find us under the profile name millbridgecourt. Earlier on this Summer, C & D had their beautiful Wedding Day here at Millbridge Court which saw some really fantastic industry suppliers come together to bring their fairytale day to life. The Bride & Groom were lucky enough to have the illusive Summer sunshine make an appearance on their big day, which enabled them to have the most breathtaking Arbor Ceremony, complete with exquisite milk churn floral arrangements, abundant with blush and peach blooms, created by the uber talented Hannah Berry Flowers. The heavenly floralising didn’t end there, with Hannah creating elegant & fragrant centrepieces which looked so perfect alongside the soft grey linens & glassware chosen by the couple. The abundant milk churn arrangements were also brought inside following the Ceremony to frame the top table, a wonderful way to make the most of show stopping flowers! Further adding to the Dining Barn’s styling was C & D’s Wedding Cake; a four tier gold leaf, peach & grey marble masterpiece made by Elle Gerrish (Designer Cakes By Elle) which consisted of a Lime & Coconut, Red Velvet & Caramel layers with a salted caramel drizzle. Their chosen photographer was none other than VLA Photography, who captured all of the days details so beautifully along with all of those special moments. Thank you to Jon & Laura for allowing us to share their beautiful images & we’re so excited to have chosen a selection for you all to see below. In April, we hosted the most breathtaking Spring Wedding Day involving a plethora of truly wonderful MBC Partners. From the very first day R+G visited Millbridge Court they had such a wonderful vision for their Wedding and it was such a pleasure to guide them through the planning process and hear about all of their exciting ideas. No detail was left unconsidered with the couple having their menus handwritten by calligraphy genius Judy broad Calligraphy and their guests were spoilt with an interactive menu by Kalm Kitchen and delicious cocktails available for everyone as they left the Wedding Breakfast… it’s all in the little touches. The immensely talented Hannah Berry Flowers was the florist in charge of bringing their elegant vision to life, which she did oh so perfectly. The Barns were adorned with heavenly fresh, white, clean centrepieces and arrangements that made the Venue look so romantic. The lady chosen to capture the love, the joy, the gorgeous details and so much more, was the fabulous Sarah Legge Photography. On R+G’s first visit to us they looked through a photo album from one of Sarah’s previous Weddings shot here at Millbridge Court and they knew right away that that was the lady for the job. Her images speak for themselves and she’s also a complete joy toward alongside on a Wedding Day. In April of last year, we had the privilege of hosting the Wedding Day of the wonderful Mrs & Mrs O’Brien. A Wedding day that was bursting with love from start to finish, something that is so evident when looking back at the photos from their day. B&L enlisted the help of three utterly fantastic MBC Partners to create their dream day & with the Spring season having just arrived, B&L made the most of the beautiful flowers that were in bloom with a soft colour palette of whites, greens & purples. In charge of creating their floral arrangements & stunning Bridal Bouquets were the lovely, Eden Blooms who transformed the Ceremony Room by creating gorgeous, fragrant pew ends & a handful of arrangements which were put on a rustic ladder stand & wooden crates. 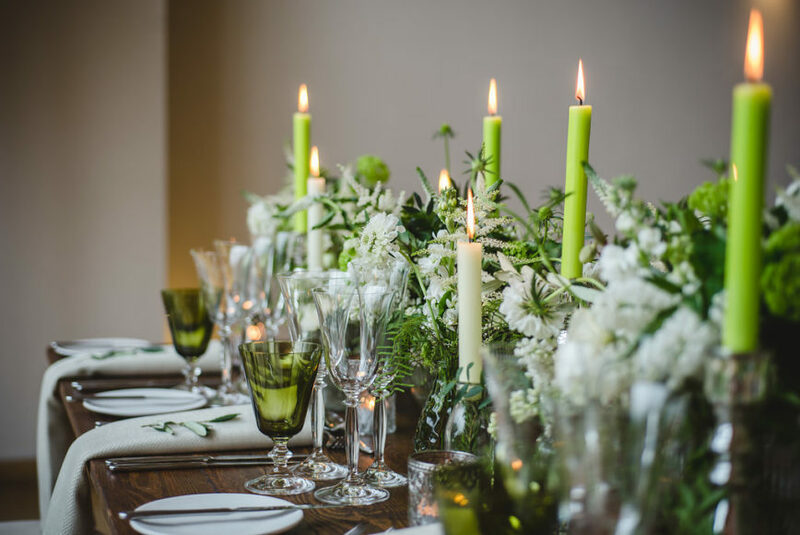 The Dining Barn featured soft green linens & glassware which complimented their Springtime look so brilliantly, & alongside the centrepieces, Eden Blooms made a feature of the shelves by draping long stem flowers from the pegs. Simple, yet so effective & making for a wonderful backdrop! Their stunning, three tier naked cake was made by Milk Street Kitchen & was decorated with fresh berries, topped with blowsy white blooms. The cake took centre stage in the Dining Barn on our wooden island & was surrounded by spring time flowers. Their photographer was the super talented Guy Collier, a photographer who you could tell really ‘clicked’ with B&L & who is always such a pleasure to work with. He ensured all of the spontaneous, loving moments were all captured so perfectly & you can get a real sense of the joy of the day from seeing his photographs. So, all it leaves for us to say is thank you to Guy for sending us the gorgeous images featured below & thank you to Mrs & Mrs O’Brien for allowing us to a part of your spectacular Wedding Day. We wish you so much love & continued happiness in your married lives together.